The History of Genetic Modification in Embryos | The Ethics of "Designer Babies"
Picture: Displays how the first baby was genetically modified. The first incident of a “designer baby” occurred in the mid-1990s. It was facilitated by a man, Jacques Cohen, who believed he had discovered a way for infertile women to become pregnant. In order to achieve this, Jacques used DNA from the mother, a father, and also a third party DNA donor for “cytoplasmic transfer.” It was later found out that this “cytoplasmic transfer” actually gave the children extra mitochondrial DNA. Thus, the first “genetically enhanced” baby was born. 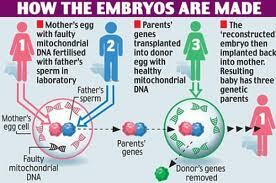 Still today, there is avid research occurring concerning the genetic manipulation of embryos. It is called “reprogenetics.” As of late, if parents have the ability to afford the procedure, it is possible to pick the gender of your child as well as having your child genetically “cleared” of any genetic disorder as a preventative attempt. It is only a matter of time before a baby’s appearance and personality traits are able to be changed. The technology is there, but it is not mainstream yet due to it’s questionable nature.